Aluminum is a silvery-white metal that is non-toxic and resists corrosion. It has high thermal conductivity, and is the most abundant metal in the Earth’s crust. The metal is found in the minerals bauxite and cryolite, and was first extracted in 1825. Often aluminum is alloyed with other metals, such as copper, magnesium, silicon, tin, zinc and manganese. Aluminum alloys are lightweight and strong, which makes them desirable for the construction of aircraft and spacecraft. An alloy of boron and aluminum is used for electric power cables for transmission lines, and the metal is also used to make cans, foils and kitchen utensils; additionally, it can be deposited on the surface of glass to make mirrors. If you’re interested in the aluminum industry, read on for a brief overview of the metal, from supply and demand to how to invest. China is the world’s largest producer of aluminum, but supply from the Asian nation has faced restrictions lately. In June 2017, Bloomberg reported that China’s largest aluminum smelter will be cutting its capacity by 250,000 MT annually. The country is planning to restrict production as part of the government’s Winter 2017 Air Quality Pollution Prevention Plan. Under the plan, aluminum industry producers in 28 cities are reducing their aluminum output by over 30 percent. China’s aluminum market is also facing external pressure. In April 2017, the US Department of Commerce launched a trade probe to investigate whether Chinese aluminum imports pose a threat to the country’s national security. Government officials said only one US firm produces the high-purity aluminum used for American combat aircraft. The probe could lead to the US imposing tariffs on aluminum imports. Concerns about Chinese supply have caused aluminum to outperform other metals on the LME. Goldman Sachs (NYSE:GS) said midway through 2017 that it expects aluminum prices to rise to $2,000 in six months and to $2,100 in 12 months. As aluminum supply tightens, demand from many sectors is poised to grow. A Global Market Insights report estimates that the aluminum alloys market will exceed $150 billion by 2024. Global factors projected to drive demand and contribute to aluminum price gains include: increasing air travel, growing construction and infrastructure projects in countries with emerging economies. What’s more, Research and Markets expects aluminum use in the global automotive industry to reach $42.4 billion by 2022, with the Asia Pacific region as the largest consumer. Growth will be driven by increasing vehicle production, government emissions regulations and rising gas prices. Recent aluminum price gains have been reflected in the share prices of major aluminum companies, and for that reason many investors want to invest directly in aluminum-focused companies. For instance, the share price of American aluminum firm Alcoa (NYSE:AA), which produces one-fifth of the world’s aluminum, rose about 15 percent in the first half of 2017. You can read more about other major aluminum producers by clicking here. 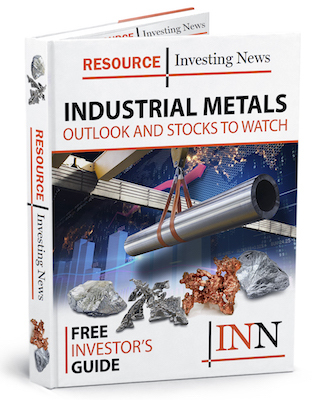 Other options for investing in the aluminum industry include the iPath Pure Beta Aluminum ETN (ARCA:FOIL), which is an exchange-traded note that delivers returns through a futures-based strategy. In addition, ETF Securities offers leveraged and inverse aluminum exchange-traded products in European markets, along with traditional long-exposure funds. Exchange-traded funds such as ETFS Aluminium (LSE:ALUM), which invests in firms mining and selling aluminum, are another option. This description was last updated in July 2017.